Accurate works offers Stackers conveyors. 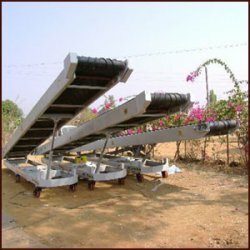 This type of Belt conveyors are one of the popular type of material handling equipments. It is reliable industrial conveyor light in weight and endless belt made of fabric rubber. These conveyors find excellent use in warehouses, sugar industries, chemical industries. Were bulk quantites of bags, boxes are conveyed. Tel : +91 0265 6584 737 / 2644 408. Fax : +91 0265 2644 408.